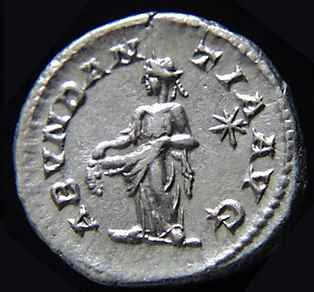 Abundantia -- Roman goddess of good fortune and prosperity!! Provenance: Contemporary. This recipe was developed only last fall, and is derived very loosely from the recipes on the side of the Trader Joe’s lasagna noodle box. A couple of bottles of any Spaghetti or Pasta Sauce (preferably without high-fructose corn syrup. You know what they say about high-fructose corn syrup). Whatever cheeses happen to be in the fridge, within reason. Chop up the Veggies. Grate up what seems like enough Cheese, but then keep the Cheese out because you’ll probably end up wanting to grate up some more. 1) Use either two 8 1/2' x 5'ish baking pans or one 9' x 9'ish baking pan. Put a thin layer of Sauce on the bottom of the pan, and then put a noodle or noodles on top of it. 2) Sprinkle some Veggies on the Noodle(s). 3) Pour some Sauce over the Veggies. 4) Sprinkle some Cheese over the Sauce. 5) Put down another Noodle layer. 6) Pour the remaining Sauce on the top Noodle layer. 7) Sprinkle the remaining Cheese on top of the Sauce. 8) Bake at 375 F for 45 minutes. This recipe embodies some of the greatest virtues of casual cooking. It is, as you would expect from the ingredients, yummy. It is very easy to make. It is reasonably nutritious, and inexpensive. It is good for using up ingredients that are reaching the end of the road. And, unless you are feeding many mouths, it can be stretched over a week to ten days worth of occasional meals. Excellent! I find it is important to grate more cheese than you need because although I know it is impossible grated cheese tastes better than slices or chunks. I find that I end up with half the cheese I orginally grated by the time I need to use it in the recipe. No ricotta or cottage cheese or mashed-up tofu to hold the rest together? Does it cut ok like this? I do love veggies in my lasagna. This is the most self-referential lasagna recipe I have ever seen in my life. i really like this recipe. i never make lasagne because it always seems to use something i don't have: for instance, ricotta. so to hear you can pretty much just use anything you have is great. what sorts of cheese do you typically find in your refrigerator? You can easily substitute cottage cheese for ricotta--beat in an egg and don't even bother to mash the mixture smooth. Thawed frozen spinach--squeezed dry and chopped--can be mixed with it, too, along with herbs or pesto. Most vegetables "sweat" a lot of liquid when cooking, so just dropping them in can sabotage a dish. Instead, saute them til translucent/semi-tender--allow the excess liquid to cook off--and mix with the red sauce. Dry cheeses will work better than softer, oily cheeses like cheddar or jack. Note to Self: If ever invited to Michael5000's house for dinner and lasagna is served, put it in a napkin and dispose of later. It may be made with expired cheeses and other random soon to go bad stuff.